The most important work on seventeenth-century New England in a generation. In the tradition of Edmund S. Morgan, whose American Slavery, American Freedom revolutionized colonial history, a new generation of historians is fundamentally rewriting America’s beginnings. Nowhere is this more evident than in Wendy Warren’s explosive New England Bound, which reclaims the lives of so many long-forgotten enslaved Africans and Native Americans in the seventeenth century. 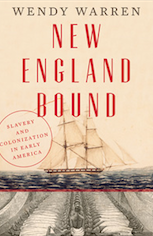 Based on new evidence, Warren links the growth of the northern colonies to the Atlantic slave trade, demonstrating how New England’s economy derived its vitality from the profusion of slave-trading ships coursing through its ports. Warren documents how Indians were systematically sold into slavery in the West Indies and reveals how colonial families like the Winthrops were motivated not only by religious freedom but also by their slave-trading investments. New England Bound punctures the myth of a shining “City on a Hill,” forcefully demonstrating that the history of American slavery can no longer confine itself to the nineteenth-century South.